A couple of months back I watched a Woody Allen movie called “Melinda & Melinda”. Even though the movie as a whole was not very admirable (Woody Allen has definitely made far more exciting and interesting movies than this) one thing that strikes is the concept of the movie. The movie begins with a scene at a coffee shop where four writer friends are having a debate - is life naturally comic or tragic? Of them, two think that life needs to be dealt in a serious manner with full of emotions and sentiments and mostly ends in tragedies. On the other hand the other two think differently and they see life as an entertainment, perhaps a comedy which commands us to react in a lighter manner. So they begin to frame a story; story of a lady called Melinda. Her story takes two different directions based on the writers – one tragic and the other comic. The movie ends with a note that whether comic or tragic it’s our perspective towards life which influences what it is. Well I do not think life can be only tragic or only comic, because one cannot take life lightly always or neither can he take it seriously. There are situations that make us happy, laugh or excited but at the same time some make us sad, cry or depressed. So life needs to be a balance of both. When you are depressed you must make sure you cheer up your mind by approaching at situations lightly and when you are too carefree you may want to slow down and give life a little serious thought. If one is to always believe that life is fun perhaps shall be the one most depressed when grief strikes and if one is to accept that life needs to be dealt with lot of seriousness then he may miss out so many moments of fun that comes out of trivial things. In spite of understanding this equilibrium we tend to force ourselves to the comic side and we secretly hope that life has to be comic always; perhaps this expectation itself is what makes us frequently disappointed. So what do you think – Is life naturally comic :-) or tragic :-(? Having nothing specific to do during the New Year, I decided to travel alone to finish of my Kolar district research. 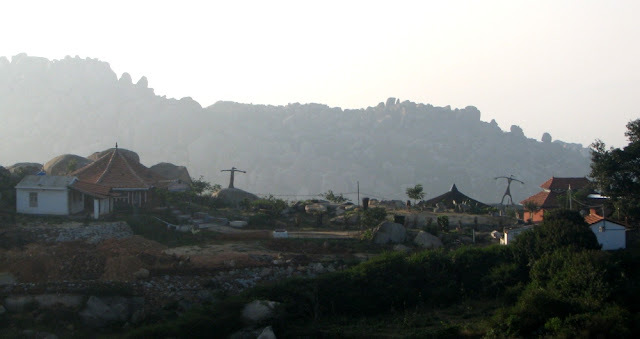 (Exploring Kolar ; Revisitng Kolar) Even though I had some reservations previously I am very glad to have done this trip. At around 6AM on the 1st of Jan I had left home. The roads were less populated at that early hour of dawn and I got out of the city pretty easily. The next stretch till Kolar was a little strenuous due to the 4 lane construction work frequently requesting for a De-tour. My first hitch hiker was a college student who had missed his bus and was getting late. Thanks to him, for prompting me to my destination as we reached Kolar. I had my breakfast and started driving to Srinivasapura. A few kilometers gone, I realized I was running out of fuel but there was no heading back, I drove the next 20 kms to the next town and refilled the tank. The drive was amazing with empty road and music playing on my ears. From Srinivasapura I drove to Ronur, which is a small village and my first stop – Lakshmi venkataramana temple which was unfortunately closed. So I click some pictures from the outside and return. On my way back I ask for advice to reach Yeldur. 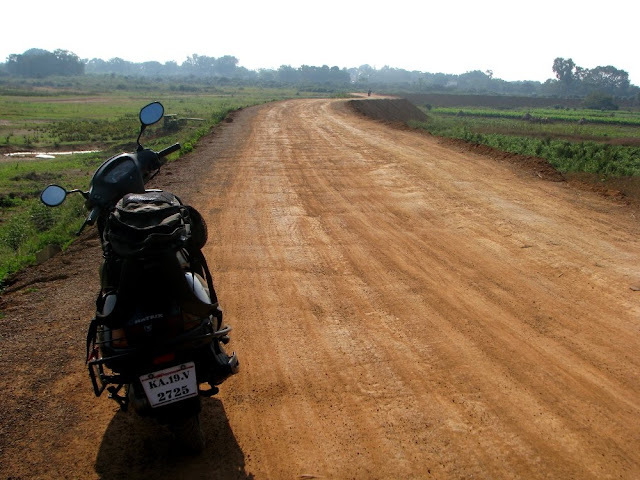 A villager gives me a better option than returning to Srinvasapura; he suggests a mud road as a shortcut. I am glad I took his advice because the route was the most amazing one I have ever ridden on. The bumpy rides along the mangoe grooves was amazing along a path I doubt if even appears in any map and as motorcycle journalist, Dan Walsh says – These are the days that must happen to you. During this ride, I knew what he meant. 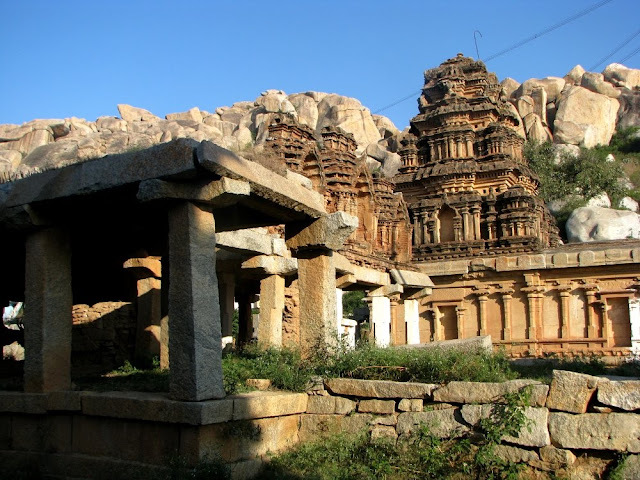 I reach Yeldur and visit the famous Kodandaramswamy temple which was built by the Cholas. The priest informs me that the deity is installed by Brighu Maharishi. The temple is undergoing a renovation now with a new gopura. I was offered pongal and puliovgere as prasada. From Yeldur, I drove to the Srinivaspura-Mulbagal road and a deviation to Arikere to visit a 1000 year old Naganatheshwara temple but now renovated to look better from the earlier ruined version which is now seen as a photograph on the walls of main shrine. My next stop was Devarayansamudra. Thanks to an old man who guided me through a shortcut which saved me around 10KM drive. I reach the deviation to Devrayansamudra on Kolar-Mulbagal road. I have my lunch at a restaurant and head to the hill. In the village, a school boy suggests that I climb the hill from the other side, which happens to be his village and he says it’s more beautiful there. Looking at his passion, I do not wish to disappoint him and take the route around the hill. He said he would have joined me but had to collect the dried raagi from somewhere. My trek to the summit is one memorable experience. This was the first time I was trekking alone and I absolutely enjoyed it. Not always but once in a while you must try certain things alone to put yourself on to a test, to judge your ability to make decisions, to put your stamina on to a test. 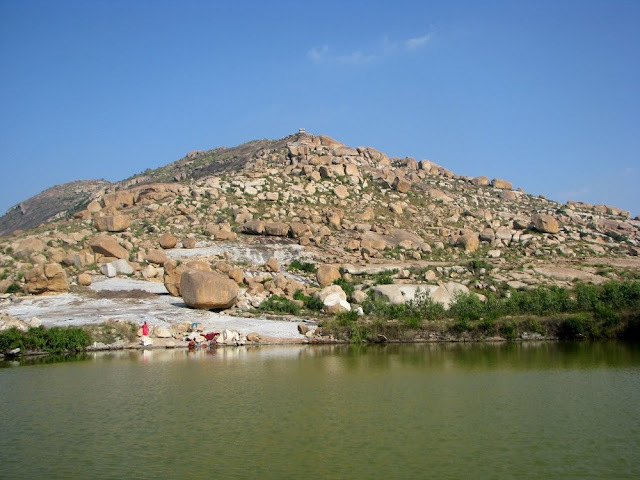 Devrasyansamudra had absolutely no trails, I had to make one and hence it seemed challenging at times but something within me kept saying – no I won’t return until I reach the top. But as always once on the summit, everything seems to look so beautiful that the entire effort seems so fruitful. I returned to Kolar and booked a hotel room and took a walk around the town. Noticing nothing much to do, I went to bed very early. I walk down to Theerahali where an ancient temple invites me but whose history none in the village knows. The temple was closed. I decide to take the bus back to town and wait under the shades of a tamarind tree along with many villagers waiting for the bus. I board the crowded bus and return back to Kolar and then take an auto-rickshaw to Antargange and ride back. Shivarpatna is famous for its sculptures. 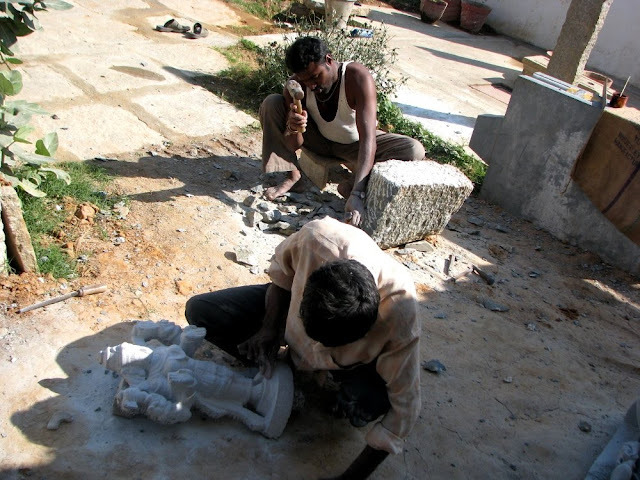 The vishwakarmas have been creating beautiful sculptures for ages now; a kind villager takes me around and shows the various sculptures they have made. He explains to me various types of stones that are identified by difference in color. A walk around the village were almost everyone seem to be carving stones is an experience to remember. An old man explains me that his wax idol making process is very ancient and he wishes to learn new technology if someone can come and teach them. I ride back to the main road and drive to Malur and then to Chikka Thirupati which is very crowded and hence I have the Darshan from outside and return. 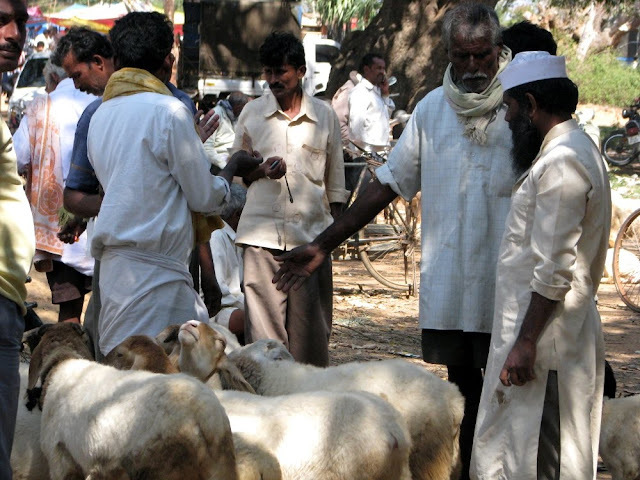 Outside the temple is Mela were goats are being sold. Lot of negotiation was happening and a man says one sheep was priced somewhere between 2300 to 5000 and most of them were being bought by butchers. I drive back to Bangalore via Sarjapura. This has been definitely a very interesting experience for me and as I complete traveling the entire district of Kolar, I still can’t say good bye to it, as I wish to return there on a full moon day to watch a drama in Theerhahhli. So Kolar will be always special and I will visit here again for sure in spite of having completed my travel research.